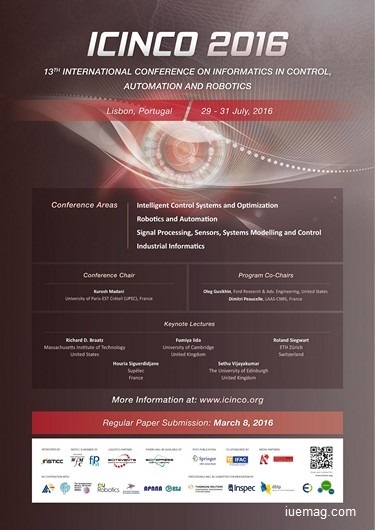 The purpose of the 13th International Conference on Informatics in Control, Automation and Robotics (ICINCO) is to bring together researchers, engineers and practitioners interested in the application of informatics to Control, Automation and Robotics. Four simultaneous tracks will be held, covering Intelligent Control Systems, Optimization, Robotics, Automation, Signal Processing, Sensors, Systems Modelling and Control, and Industrial Engineering, Production and Management. Informatics applications are pervasive in many areas of Control, Automation and Robotics; This conference intends to emphasize this connection. ICINCO 2016 will be held in conjunction with SIMULTECH 2016. Any facts, figures or references stated here are made by the author & don't reflect the endorsement of iU at all times unless otherwise drafted by official staff at iU. This article was first published here on 21st January 2016.